Homeowners face certain challenges when they try to select a bathroom lighting option that is right for their needs. While they require sufficient light to see for shaving, applying makeup and other grooming tasks, they may prefer a softer lighting option, as well, for when they soak in the tub. After all, bright light is not conducive to relaxing. Today, there are a number of viable options for illuminating a bathroom in a way that you can obtain both types of lighting without much of a hassle. Bar lights over the bathroom mirror and matching fixtures on each side of the mirror are two ways to provide adequate lighting for grooming purposes without shadows or glare. Fixtures such as these come in chrome, antique finishes and even in colours. Overhead lighting is not ideal for applying makeup, but may work for those who just need to shave, brush their teeth or groom their hair. These light fixtures come with different colours, sizes and styles of globes. Certain light bulbs on the market today come with white glass instead of clear glass to provide a soft light. When you soften illumination in this manner, it provides a warm ambiance to the bathroom. You will discover that it is ideal for a relaxing soak in the tub, a quick shower or a trip to the toilet without being harsh. If you have limited space, you may need to install just one light fixture. When this happens, you can still receive all the types of illumination that you desire for your bathroom by simply installing a dimmer switch. Adjust the light higher for grooming and lower for your soak in the bathtub. Perform research on all the available lighting fixtures for your use today. With the right research, you will discover the ideal bathroom lighting option for your specific style of bathroom. There are ceiling, hanging and wall fixtures in all types of styles, shapes, colours and price ranges. In addition, you can select from LED or CFL bulbs, which of energy savers in comparison to the incandescent light bulbs of the past. For further information on how to select the best lighting option for your bathroom, consult with Concept Bathrooms & Construction. 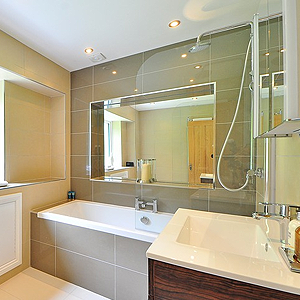 We are experts in the new construction and renovation of bathrooms along with other services. Our company will guide you in the right direction for your house.